SHIBORI: (shee-boh-ree) The best known Japanese craft textile, from the word shiboru, to twist. Usually done on either silk jacquard or cotton with aizome, shibori techniques include tie-dye, stitch and dye, or the famous “rice” tie-dye. These are all-purpose craft textiles, but the silks are especially suited to small needle crafts, patchwork, or remade garments. KASURI: (kah-soo-ree) Japanese ikat. Highly prized by Japanese craftspeople, the warp and/or weft threads of these textiles are dyed in a pattern before weaving. Used for small patch crafts like handbags, for framing on wall hangings, for cushions or for wearable art. Both cotton and silk kasuri are desirable for crafts. CHIRIMEN: (chee-ree-men) This dense, high twist silk yarn is woven in a luxurious crepe. Antique remnants with desirable small pattern, yuzen, or hand painted detail may sell for hundreds of dollars and are framed like a picture in other textiles or used for small needle crafts, like ningyo (dolls), and doll clothing. TSUMUGI: (tsoo-moo-gee) Once a low grade home made textile, now highly sought after, this raw silk textile was traditionally made from cocoons raised in the attic, then brushed and spun like hand spun wool, and finally dyed and woven. Tsumugi yarn is commonly used in the most valuable kasuri, especially Oshima-tsumugi. This stable textile is easy to work with for quilting or patching. YUZEN: (yoo-zen) A technique for embellishing textile involving rice gluten resist and hand painting or kata. Yuzen may require a number of steps involving several artisans to work on a single piece of textile, making this artwork labor intensive and valuable, especially for antique, hand painted or artistic examples. AIZOME: (eye-zoh-may) Ai is for indigo; zome means dye. A dark blue natural dye used mostly on cotton, in combination with other techniques. DOROZOME: (doh-roh-zoh-may) Doro meaning mud; zome again is dye. A natural brown mineral dye best known for its use in silk kasuri. KATAZOME: (kah-tah-zoh-may) Kata means form, in this case, a stencil.. Various katazome techniques are used on all types of textiles. SASHIKO: (sah-shee-koh) Commonly done on aizome in white cotton thread, a type of stitchery done to strengthen and beautify utilitarian textiles and garments. 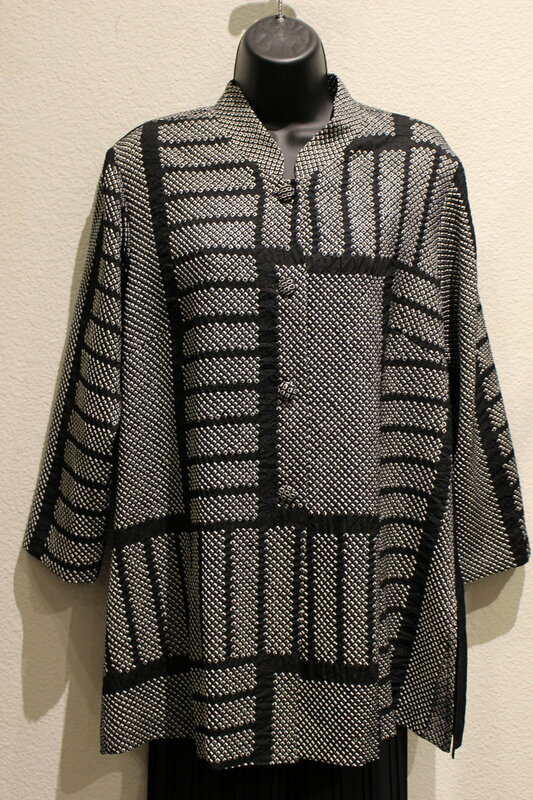 Collectors pay thousands of dollars for antique sashiko garments in any condition. SAKIORI: (sah-kee-oh-ree) The Japanese say that they reuse their textiles to the last threads, which are then shredded and rewoven into sakiori. These are used for mats, bags, or remade into new garments. Craftspeople are the ultimate recyclers. Recovered shibori silk from a vintage kimono. 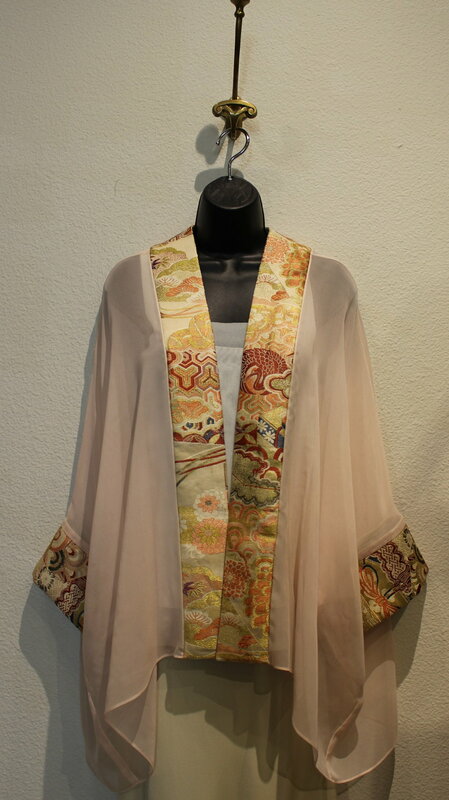 Beautiful yuzen artwork recovered from a vintage tomesode, combined with 2 ply silk crepe self, formal and elegant. 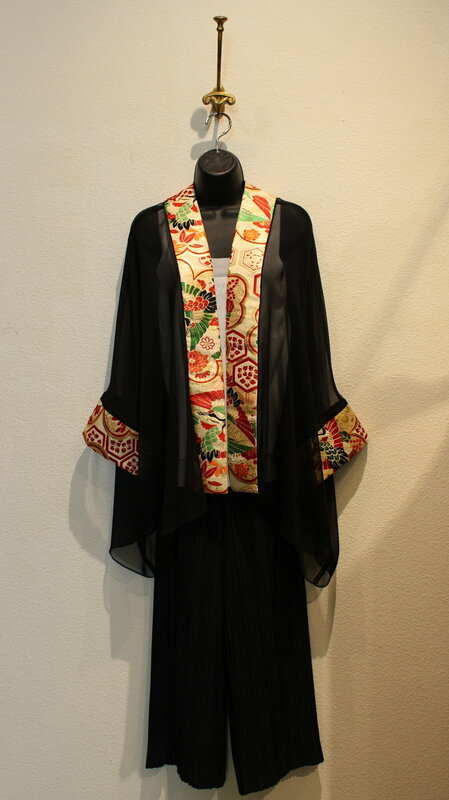 Made from a vintage Tomesode (mother-of-the-bride kimono). 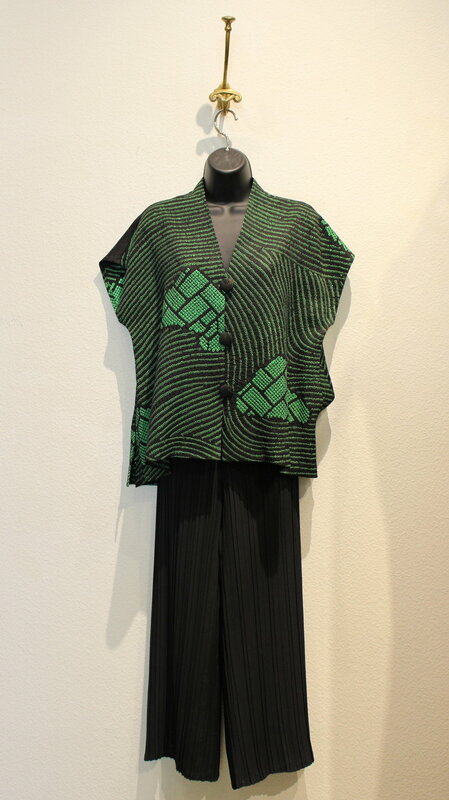 Artwork is vintage yuzen, textile is chirimen crepe. 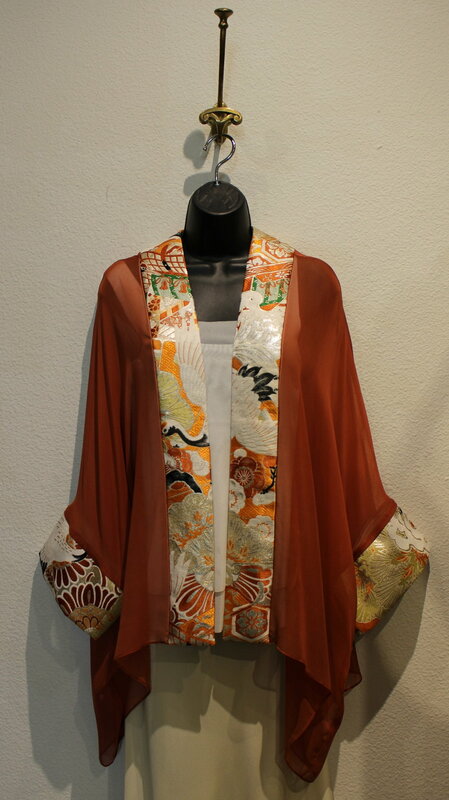 Three coordinated types of kimono silk, our best-selling item. 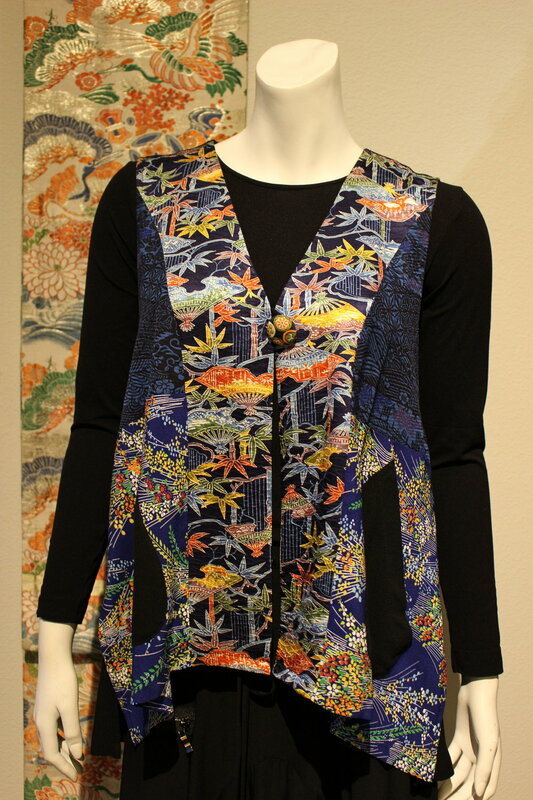 New Fitted Kimono Vest with loop buttons, You can enjoy the different way. Beautiful silkbrocade recovered from vintage Obi. It is the longer jacket. come with Ivory Chiffon, Black Chiffon, Gray Chiffon, Blue gray Chiffon, Coral Chiffon etc.